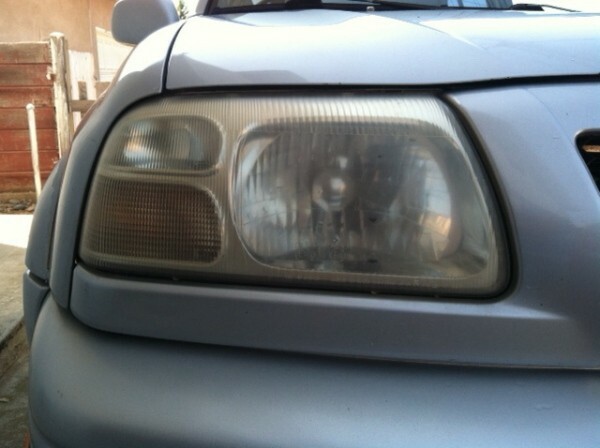 Headlight covers over time can become yellowed or hazy. This is a guide about cleaning foggy or hazy headlights. Someone was just asking about a remedy for yellowed dingy headlights so I thought I would share with everyone what ended up working for me. My car headlights were horribly yellowed after 12 years of ignoring them. I could barely even see when driving at night because that's how bad they were! Headlight lens restoration kits are $20.00 or more and contain enough supplies for a one time only use. For about the same price you can purchase the items in larger quantity separately and will then have enough supplies leftover for future restorations, and even to use on other projects, plus you might already have some or all of the items needed already on hand to do the job. Wash the lenses very well with soapy water, rinse and wipe dry. Dip a corner of a rag in denatured alcohol (you can purchase it at paint stores and most hardware stores), rub it on the lens in a circular motion, repeat if necessary, until the lens loses at least the majority of the yellow coloration and then rinse. Quick soak a piece of 800 grit wet sandpaper in water, then sand the lens using small, circular motions until all yellowing is removed, then repeat using quick soaked 1,000 grit sandpaper and then again with quick soaked 2,000 grit sandpaper until lenses are smooth. It is a must to apply a coat of car wax afterwards to protect the lenses! Rub the wax on in a circular motion with a clean rag and then buff out after a couple of minutes. Recently I noticed the headlights on both my car and especially my son's car were quite hazy, thus reducing visibility at night. I purchased a cleaning kit at the automotive store, (not cheap,) which involved several steps, but didn't notice much difference in clarity of the headlights on either car. Two weeks ago, I was washing the cars and decided to use one of those white scrubber sponges you see advertised on TV. (Not mentioning any names, as the generic type work just as well, and are a good deal cheaper.) It looks like a little brick, and cleans just about anything. I had used one to remove tar and bug residue from my car exterior before, so thought I might give it a try on the headlights while I was at it. What a great idea! It did a wonderful job on the headlights of both cars, and took just a few minutes. My car was parked in the shade, so these pictures don't do justice to the before and after difference, but trust me, the small investment you make will be well worth it! I wouldn't do this unless your headlights are old, very yellowed, and foggy. If your headlights are already damaged as in you've used sandpaper and/or restorer and NOTHING is bringing them back from the fog, you can use baby oil on a paper towel and buff until clear after you wash them well. If your automotive headlights get yellow or dirty, try to clean them with some rubbing compound. Just make a past and rub it into the headlight plastic covers and then wipe off. They will come clear like new. Does anyone else have a problem with the inside of your windshield fogging up? It almost looks like a haze. Turning on the defroster does not help. I've tried water and ammonia. That works for a few days, then it's back again. Maybe I put too much water or ammonia in the bottle. Try using White Vinegar on a clean towel. Pour a good amount on the towel and wipe it into the window. After you wipe it in, Take another clean towel and wipe the vinegar off. I had this problem also. Regular window cleaner did not completely take care of it, either. I went to an auto supply store and got some Armour (I think) car window spray cleaner (NOT the kind in a gallon jug you put in the reservoir) and it worked great! Eventually you have to clean it again, even if you are careful not to touch your windows, because of the outgassing of the materials that make up the interior of your car, along with normal dust and dirt. that haze is from the dashboard letting off gasses. I use to think it was from my hubby smoking. putting a shield over the window to keep the dashboard cooler in the summer might be helpful in not having to clean it so often. not sure as we moved to a cooler climate. Good luck! I read somewhere to rub a bar of soap over the inside of your car windows, and we tried that last fall and winter, and it did seem to work. of course, it does need to be re-done every few weeks. My grandfather (who was a lifetime mechanic) taught me how to keep my windows from fogging up. When you turn on your defogger, make sure you have it set on "outside air" or fresh air.. not the setting where the air is just recycling around the inside. And make sure it is set on warm..not too hot or cold. Did you check your heater core? If it's leaking it will put a haze all over your windshield that is hard to get off. Angie, Your not alone, I have a 07 Acura TL that I am meticulous about, I have tried every window cleaner on the market as well as making my own and still a day after cleaning my glass it looks like I cleaned with Crisco oil. I think this is caused by gases being released inside the car from the dash and upholstery. I'm checking this and other sites for a solution if I come up with one I will post it. Could a Brillo pad be used to remove the film and oxidation that is on the headlight lenses? I have used the toothpaste method and the baking soda method and neither helped. Go to an auto parts store or Wal Mart and you can buy a product from 3M Co that will clean up the headlight lens. There may be other products that will also work. 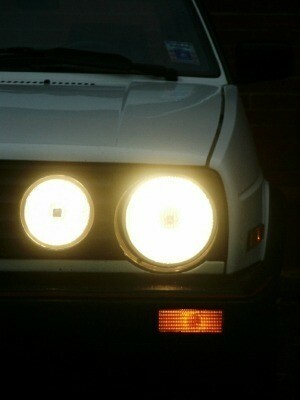 You can also check out google.com and type in headlight lens cleaners or words to that effect. Could a Brillo pad be used to remove the film and oxidation that is on the lens? Also, I would not use much pressure, but the cloudiness seems to remain. I have used the toothpaste method and the baking soda method and neither helped. Thanks if you could answer this question. You can go to an auto parts store and buy a 3M product for restoring the headlight lens. Wal Mart sells one from 3M Co. Go to WalMart.com,click on auto refinish accessories. There are other companies that also sell restoring kits. I doubt a brillo pad would work. You can also check out items at google.com. Type in auto headlight lens restoring kits or words to that effect. The 3M Headlight Lens Restoration System helps restore hazy or fogged headlight lenses, increasing visibility on the road and the appearance of a vehicle. Using it will save hundreds of dollars versus replacing dull and foggy headlights. It's easy to use and comes with detailed instructions. What do you recommend for cleaning dingy auto headlights? How do I clean automobile headlights? Mine are really stained. I know they have the kits, and the pros, thanks! How you do remedy the dingy yellow film on vehicle headlight lens? What can be done for interior cloudiness of headlight covers? 3M makes a product to dress up the faded lens. It is available in Auto stores. You will sand the lens using products that come in the kit. You sand using an electric drill. If you go to google.com and type in "3M products to restore headlight lens" some sites will come up so you can see the product and read the step by step directions. For a small fee a body shop will polish the lens of your headlights and they will look like new. Any dust or film that is on the inside will be removed also. We tried a product from the auto store, kinda worked but not all the way clear. I suggest you go with Anna Parker. The yellowing you see is oxidation from sun exposure. There are degrees of oxidation, and the degree to which it can be removed depends on how much work you are willing to do. 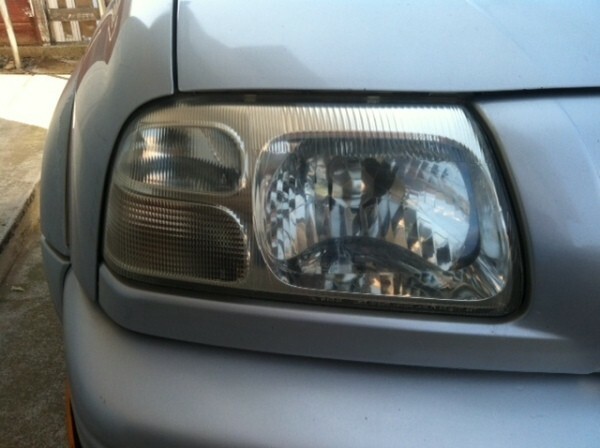 The only way to completely restore a yellowed headlight is to remove the oxidation, exposing new live plastic. If there is extensive micro cracking deep into the plastic, the headlight may not be restorable, but surface oxidation and micro-cracking can be successfully removed. The trick is to remove just enough plastic to make the lenses clear again and then protect them from future damage. Yes, the creams and pastes will work to some extent in making the lens look clearer temporarily, but this is mostly a result of filling in the micro pitting / cracking on the damaged lens, and doesn't last. They are a quick cheap temp fix at best. The kits such as the ones made by Permatex, Meguires and Turtle Wax do work really well, but you have to follow the instructions exactly, or you will damage the headlight, as some here apparently have. One trick I have found that helps is to if at all possible, remove the headlight from the vehicle, as it makes it a lot easier to do a proper job. Now to the kits. They are all basically the same in that they have 1) Abrasive sheets, pads, or sandpaper, usually in grits of 1000, 1500, 2000, 2500, and 3000. 2) Some sort of polishing fluid or paste. The trick with the abrasives is to start with the FINEST one that will remove the oxidation (1000 grit is the coarsest I'll start with) and to keep the headlight and the sandpaper pad very wet. Soak the paper for a few minutes in water, and keep a spray bottle of water handy to keep the headlight and paper wet. Spray the headlight, the, sand back and forth in one direction with the 1000 grit (keep it wet) until most of the oxidation is off and you have a smooth surface. Then wipe the residue off with a wet terry cloth towel, and switch to 1500 grit, sanding 90 degrees to the direction you did with the 1000 grit. (Again keeping everything very wet.) Wipe it off again and now go to the 2000 grit, 90 degrees from the direction of the 1500 grit. lastly, wipe it down one more time and repeat with the 2500 or 3000 grit. Now wipe off all the sanding residue, take a clean terry cloth rag and use the polishing paste or liquid liberally, and polish in a circular motion, until the lens becomes clear and shiny. Step back and admire your hard work. The Turtle wax restoration kit comes with a lens sealing wipe, that you apply in one direction, then let cure for 24 hours which will prevent re-oxidation. If you aren't using their kit, you can apply Plastix polish or one of the aforementioned cremes with UV protectant. Then, whenever you wash the car, take a few minutes to touch up the headlights, and you shouldn't have to do the heavy duty cleaning/restoration again. What is the best and easiest way to clean the headlights on your car? How do I make frosted headlights clear? Whether you mean the plastic cover or the bulb itself I honestly don't think there is a way other than purchasing new that are already clear. Just a week or so ago I saw one of those infomercials advertising a new product that does just what you're asking for. SS but don't remember the name. It was something like clear lens. Perhaps you could try the "As seen On TV" web site. GL. After seeing it wish I'd paid more attention as my 97 Cadi lenses are getting cloudy! After my 1st post to you I went to as seen on TV and found the product to clean car headlight lenses...it's called Fast Brite Lens restore and costs $10. plus shipping. Good luck. I'm going to try it too. Does anyone have a DIY solution to cleaning the dirt and yellow off headlight covers on cars? Mine are just so bad! I have an '88 Mercury Cougar and my headlight covers are so bad, as far as being cloudy. I can no longer drive at night! I have looked and tried all the things I've heard and read about with no luck. Why if manufacturers make them for the cars, then why can't we buy them when something happens to them? Seems the car companies could stand to win in this situation! Does anyone have any idea on how to get the fog off of the inside of headlights? I really don't want to buy new ones. The outside is clean, it's just the inside of them that is foggy. Thank you. It may look foggy on the inside but I think it is on the outside. 3M Co. mades a product sold in automotive stores that will clean the outside of the lens. A little time consuming so check out what has to be done and the price of the product. Or you could check out salvage yards to see if they have the lens for your car that would be in good shape. I agree with foxrun - it is on the outside. The product that does the cleaning is actually an extremely mild abrasive that is applied and polished. You need to use the product from the automotive store, anything else is too harsh. My husband and I recently purchased a Turtle Wax headlight cleaning kit and cleaned them as directed and now our headlights have a foggy film on them. What's the best way to remove the film? How do you get hazed over looking headlights on a used car to look clear again? Thanks. What is a good, simple way to clean a car's headlights? I tried toothpaste, the kits from the auto store and nothing helps! It's $1200 each to replace them do you think a deoxidizer will work? I just recently got my first car. To my surprise, my new car's headlights weren't the best. They were foggy and didn't look the way I thought a new car's should look. My dad shared a tip with me. All you need is to put a little bit of brake fluid on a soft cloth. Make sure you don't get any fluid on the paint. Rub the cloth in circles on your lights. When you're finished, give your lights a good rub down on every area you wiped with brake fluid. It should do the trick. If you want, repeat as desired. Why won't toothpaste clean my headlights? I have a friend who cleaned his headlights on his '72 Chevy with toothpaste and they looked great but when I tried it on my '89 Mustang they just clouded up. Why didn't it work for me? How can I get them back clear again? The answer is simple. The chevy has glass headlights while the ford has acrylic or plastic. Glass can be cleaned with toothpaste and polish.